Shaw Air Force Base, South Carolina, USA, 14 August 2000 — A CH-46 Sea Knight crewmember leans out of the crew entry door and gives the aircrew member leaning out of the helicopter in front of his a 'Hang Loose' sign moments before taking off from Shaw Air Force Base, South Carolina. 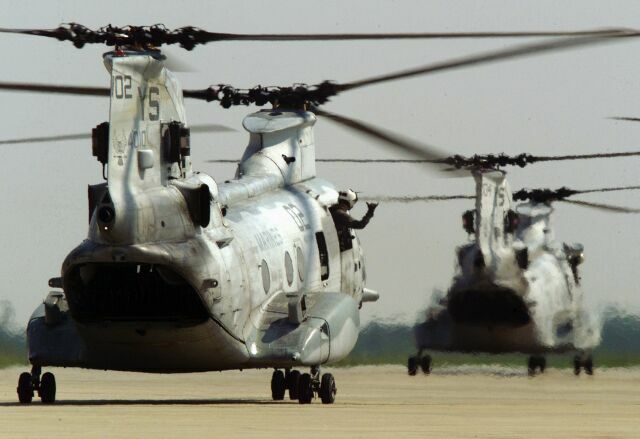 The U.S. Marine Corps CH-46s, assigned to HMM-162 at New River, North Carolina, with engines running they were "hot pit" refueled. A KC-130 aerial tanker was used on the ground as the fuel source. The helicopters were in transit during a deployment to Naval Air Station Atlanta, Georgia, for an exercise. U.S. Air Force photo by Senior Airman Greg L. Davis.